The scarf has a striking combination of colors. The background is black with flower patterns in bright orange, reds and 2 shades of pink with just a bit of green for the stems. The top of the jeweled piece is made up of a large pink bicone crystal, an orange glass round surrounded by black saucers and a large red ceramic round. Hanging separately from this, for added movement and sparkle, is a fully-faceted light pink glass coin, surrounded by darker pink bicone crystals. 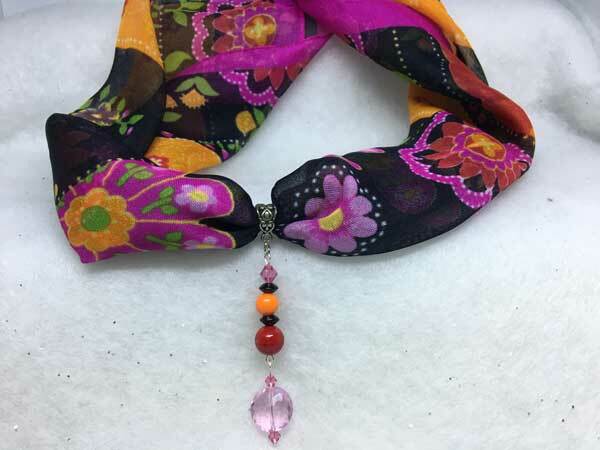 It comes with over 30" of sheer black ribbon that can be used to hold the pendant if you want to wear the scarf and jewelry piece separately.